You absolutetly want to upgrade your free version to the latest 7.2.6957. It's still free, and MUCH improved with enhancements over version 6. In particular, Macrium has recently brought out some super enhancements to the "create rescue media" functionality. I like to think I might have had something to do with their development in this direction as I had submitted a large wish-list of such features several years ago. They thanked me, and put it in the pot for future work. And many of those wishes have now come true. Now the program automatically checks both (a) the version of WinPE and (b) Macrium Reflect which you may currently have last installed into your Boot Manager version of "rescue media". If either check uncovers that a newer version is appropriate (e.g. you've now upgraded Macrium Reflect from 3954 to 3957, so that the Boot Manager copy is now out-of-date, or if WinPE for Kernel 10 has now been upgraded from 1603 to 1709, etc.) it will allow you to automatically upgrade the Boot Manager parts which need updating. This may require a new large download of WinPE but it's all done automatically for you while you watch the fuel gauge. So in this one new "carve-out functionality" in a separate window concerning creating as many of the one or more standalone "rescue media" varieties you might want to have (e.r. Boot Manager from your hard drive if available, which of course is the most convenient, small flash drive, optical CD/DVD, ISO file, etc.) it's all now possible very very easily. As far as using the system-generated "ID" vs. your own file names, I use my own file names. I name them whatever I want for maximum understandability if/when I ever go to use them again which might be a long time after they were created. In particular, I use MR constantly many times (e.g. typically at least once or twice a day if not more) during the week-long rebuild project when reinstalling Windows. I like to create at the very least names like "end of day #n, WMC and extenders now complete and working". These "progress" versions inform me of which version to revert to if a disaster strikes during the effort and I decide to revert to an earlier "stable" version I absolutely knew was working perfectly. MR always appends an appropriate incrementing suffix if you run the same job multiple times without changing the file name (where it always starts with a suffix of 00-00 for the first version generated). And of course you specify how many generations to retain (with incrementing suffixes) before deleting the oldest and re-using its suffix, in a continuing circular naming technique. The time-to-restore now present in the much-improved version 7 of the product is astonishingly clever and fast, if there's really not much which has changed in the MRIMG file you're restoring and the current contents of the target drive. The program now has a "checking for differences" pre-step (which you'd think would take substantial time, but apparently because of their brilliant indexed technique it doesn't) so that when it then actually begins the restore it might take very little time. Say you're restoring last night's image today, and you haven't done much in your system today. The restore might take 45 seconds (once it starts, after the "checking for difference")! Or, if you've made lots of changes, it might take 5-10 minutes or more depending on your hardware and file size. I myself use the non-free "standard home version" (I buy a 4-seat license pack) for my own machines, just as my way of rewarding the software vendor for their brilliant ongoing development and support for the product... which I absolutely could not live without. I install "free" for friends and family who I don't want to ask to pay for this software since it might never be used for them, whereas it is indispensible for me and my own situation. It is invaluable in building or upgrading machines, using either the (a) "copy out to external backup / change hardware / copy back from external backup" or (b) "clone this disk" methodology, which are conceptually identical but used for different new hardware situations. It is perfect for say what I just went through this week, having received a new Lenovo M910t with Win7 installed on a 1TB HDD spinner. I added my own M.2 Samsung 970 EVO NVMe SSD to be the new primary drive. I then booted to a flash drive standalone WinPE 10 + 3957 version of "rescue media" (which will work for pretty much ANY version of Windows and hardware, since it's based on WinPE 10 - 1709) in order to take my "initial out-of-the-carton factory partitions image" of everything on the HDD spinner to my external USB 3.0 backup drive. This is my true emergency backup, should I ever have the desire to go back to "factory state" which in truth I know will never happen since I take regular image backups of my "production" system throughout the years, and I can always revert to last night's or last weekend's working system if a disaster strikes. I NEVER need to go back to "factory" once I'm in production. So I had to boot to the new Win7 from the HDD spinner at least for a first time and then short while in order to at the very least install the Samsung NVMe Controller Driver (since NVMe support is not built into the old Win7 as it is into Win10). Then I installed Macrium Reflect. Then I ran Macrium Reflect (while Windows 7 was running) to "clone" the three system-related boot-involved partitions from the HDD spinner (ignoring the "recovery" partition which I never use, but that's just me). Then I re-booted and interrupted the BIOS sequence in order to get into BIOS Setup to change the boot sequence to now show the NVMe drive after (1) USB FDD, (2) USB HDD, (3) optical CD/DVD, (4) NVMe. Then I save/exit from the BIOS change and the machine proceeds to now boot to the Lenovo-provided Win7 which has been cloned over to my newly installed DIY NVMe SSD. I will eventually perform a few SSD tweaks (since the Lenovo Win7 was installed to HDD spinner), and then I will use Partition Wizard (free or non-free) to delete all the original partitions from the Lenovo 1TB HDD spinner and re-create several new "data" partitions on that drive which has now been re-purposed. I now "create rescue media" and build (a) the Boot Manager version (automatically placed on the system-reserved and C partitions which are now on NVMe), and also (b) USB flash drive standalone emergency version. System imaging the does not involve changes to the system boot / C partitions but involves other partitions or making backups can be performed by MR while operating within Windows. Operations involving changing C or system drives / partitions must be performed "standalone", either after booting from the Boot Manager menu option (if that is available and appropriate for your need) or from standalone USB flash drive or optical CD/DVD. I simply could not live without MR, especially when going through hell week during a situation like this week's total machine replacement. When reinstalling Windows it can either be from a retail installer for a home-built machine, or vendor pre-installed (like with this Lenovo M910t), but regardless when I'm upgrading or changing drive hardware and need to copy partitions, in my opinion there's no product superior to MR . I created O/S partition backup images of three machines, saving the images to a network folder that resides on another machine. All three O/S partitions held about 80-GB of information. To create and verify the images took on average 01:35:00 to complete. I then saved an image of the host machine in which the network folder resides. With 82-GB to image, this operation took only 00:19:29 to complete. Do those time figures look about average for saving to a network folder ? Considering how long it took for the network saves; it hardly seems possible that the host machine could achieve the task in 1/5th as long. I have a spare 1TB HDD internal drive that I want to use as a backup. I thought about connecting it to the PC using a SATA cable & then creating an image on it. Then at some point stick it into a USB drive enclosure. Would Macrium or Windows still recognize the USB connected drive in order to restore an image from it? It's the same drive but I'm not sure what happens when it's connected via USB. If the internal drive is 3.5", a cable won't work for it; sometimes even 2.5" drives don't work. Instead, put the drive into an enclosure (or a dock) first before using it externally. 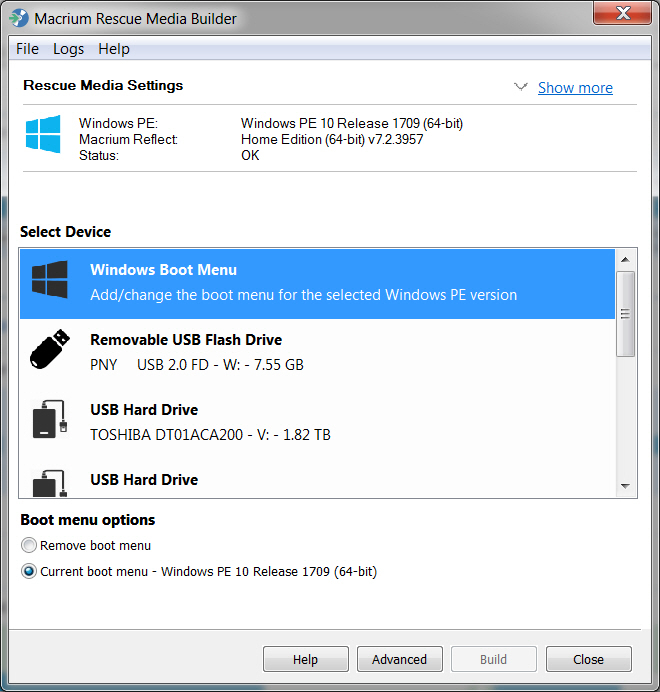 Macrium Reflect and Windows will recognize USB connected drives. I do it all the time with my notebook. You are far better organised than I am. I think I understand your question; if not, then please ignore what I say. If you are connecting the disk to SATA internally, you will need connect both, a SATA data cable(the narrow one) and a SATA power cable(the wide one). Once it is connected, if you go into disk management and assign a permanent drive letter to that disk, it will from that point onward be recognized by that drive letter, whether it be internally SATA connected or USB connected via a self-powered enclosure; thus, the "path" that the image program looks for it will be the same. I like to have "a place for everything and everything in its place". I hate it when I'm pretty sure I have something, but I can't find it when I want it. I very much enjoyed reading through that link you provided; thanks. I didn't get this organized behavior from any of my family either, as everything they ever touched was always complete chaos, even other peoples stuff. My father's policy was that it was cheaper to buy something again, than to spend time looking for it. Yes, I would connect SATA & power cables. I don't understand about going into disk management and assigning it a permanent drive letter. Other times when I connected a second internal drive the BIOS automatically detected it and the second drive appeared in Disk Management with a number such as "Disk 1" assigned to it & the partitions had letters assigned to them.